How many sounds do the letters b and d have in French? Many people would say just one each: [b] and [d]. But in fact, French pronunciation isn’t quite so straightforward: these letters, and a few others, have two different pronunciations due to a pronunciation feature called assimilation. À noter : This is an advanced lesson on French pronunciation. Before continuing, you need to understand Voicing / Sonorité and the IPA. Normally, [b] and [d] are voiced consonants, as when you say the names of the letters themselves or in words where they are followed by other voiced sounds, such as bouder (to sulk) and doubler (to double, dub). But when these same letters find themselves next to unvoiced consonants, keeping the voiced pronunciation is too difficult, so [b] and [d] change to their unvoiced equivalents [p] and [t]. 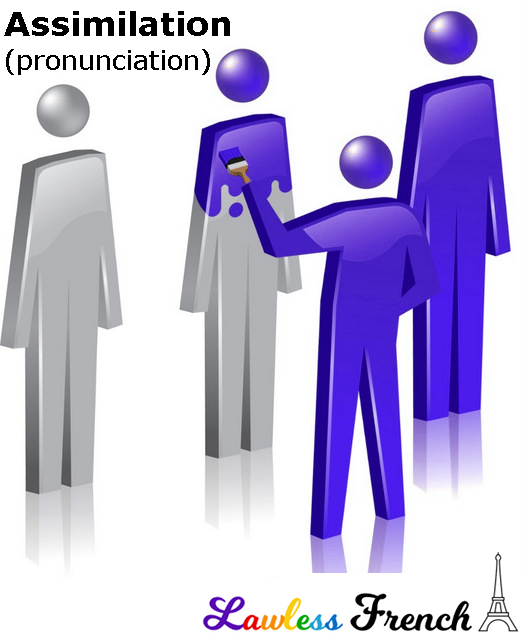 Voiced to unvoiced assimilation is the most common type, especially with the letter combinations bs and bt. French has 6 voiced/unvoiced word pairs, ordered here alphabetically by the voiced consonant. While unvoiced to voiced assimilation is found in a few words like second [sə gɔ̃], it most commonly occurs in conjunction with another French pronunciation phenomenon: the e instable. When the e is not pronounced and leaves a voiced consonant next to an unvoiced one, the former typically assimilates to the latter.